How much sugar whould we consume? Although most people think in terms of white or brown sugar from beets or cane, corn and glucose syrups are increasingly used in food products. These sweeteners are added to commercially prepared foods, such as the obviously sweetened sweets, soft drinks, jam, jelly, desserts and puddings. Other foods thought of as savoury items contain substantial amounts of sugar - tinned soups, ketchup, salad dressings and peanut butter to name just a few. Sugar is added to give flavour, texture, thickening and colouring and to act as a preservative. Dental caries (cavities) have long been blamed on sugar and sugary foods. This is still a major problem. But more important than the amount, is how often and when sugar is eaten, and in what form. Sweets between meals are more harmful that sugary foods eaten with meals and sticky or syrupy sweet foods are worse offenders as they coat and surround the teeth. Regular, thorough dental hygiene is necessary to prevent and reduce cavities. But this is more effective when combined with an awareness of sugar content in food. Sugar and products consisting mainly of sugar contribute little other than energy - they are "empty calorie foods" They are easily overeaten and can replace more healthy choices because they taste good and are not filling. Read labels carefully .Sugar is not the only word to look out for. Other forms or names for sugar are sucrose, glucose, dextrose, fructose, corn syrup, corn syrup solids, invert sugar - even honey. Many of those above ending in "ose" occur naturally in foods. Lactose, also known as milk sugar, is naturally present in milk. Fructose, or fruit sugar, exists in most fruit, many vegetables and honey. It is the sweetest of all common sugars. Glucose is the basic sugar unit of which many other sugars are composed and to which most sugars and starches are broken down by the body. Glucose is sometimes referred to as grape sugar, dextrose or corn syrup and occurs naturally in many foods including corn, grapes, other fruit and vegetables. Maltose is found in malted cereals, e.g. barley, malted milk and sprouting grains. 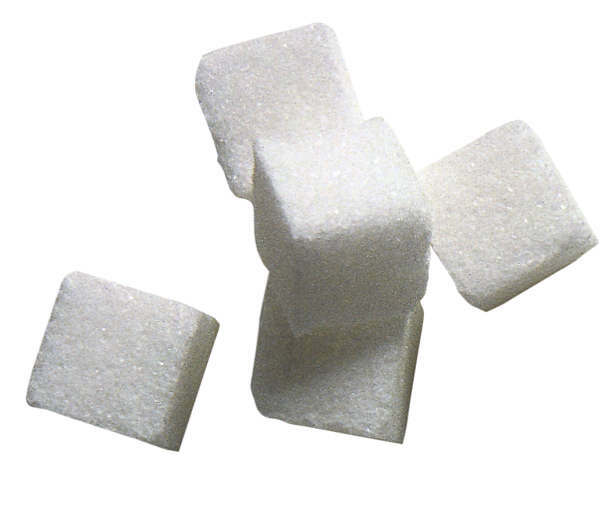 Sucrose may be obtained from sugar beet or sugar cane. That from sugar beet needs to be manufactured to remove the molasses which, unlike the molasses from sugar cane, tastes bitter. All white sugar is refined, however, this refined sugar may then be ground or coloured, so, sugar which is brown is not necessarily unrefined. It is believed that unrefined sugar contains small quantites of minerals not present in the refined sugar, however, the amounts of the nutrients are so minute that they are nutritionally insignificant. Examples of sucrose include granulated, caster, icing, brown sugar and muscavado. There are basically three single sugar molecules: glucose, fructose and galactose. There are monosaccharides ("mono" meaning one, "saccharides" meaning sugar units). From these 3 single units other sugars are formed either naturally, or by manufacture. Disaccharides are composed of two monosaccharides joined together ("di" meaning two sugar units). Other sugars and starch too, are formed by the joining of more units such as those above. Sugar enhances the flavour of many foods and is added to a number of processed items to meet consumer tastes. These requirements however, are changing as we are becoming a more "health conscious" nation and many shoppers are now looking for products with less or no added sugar (i.e. where sugar is not included so near the top of the ingredients list). Frequently "added sugar" can be reduced, for example, in canned fruit, preserves, fruit drinks, convenience meals or snacks. In many circumstances sugar removed in the form of sucrose requires replacement. This may be in the form of fruit juice (with natural sugar, e.g. fructose present) or an artificial sweetener. Sugar has certain properties which cannot always be replaced by other sweetening agents if a product with identical characteristics is to be developed. Sugar aids "foam" stabilization in products such as meringues and plays an important role in the formation of an emulsion which is required for ice cream manufacture. It is the sugar which may enhance the fruit flavour or soft drinks, create a gloss on the surface of jellies, boiled sweets and chocolate and also help to control the moisture content of foods such as sponge cakes, marshmallows, and fudge. Sugar is also an important ingredient for wine, beer, cider and bread production. Without it, the essential process of fermentation carried out by yeast would not occur. However, in many cases, the final sugar content is less than that added, because the yeast utilizes it to produce carbon dioxide and/or alcohol. The use of sugar overcomes the bitter after-taste associated with saccharin based sweeteners or the laxative effect of excess sorbitol, a sugar derivative often used in diabetic foods, which is less quickly absorbed, but equally high in energy (kilocalories). Removing "added sugar" from a product may result in a consequent change in the storage requirement. Sugar acts as a kind of preservative in foods such as jam. Removing the typically high level of sugar often requires the product to be refrigerated and eaten within a shorter time period. Excess sugar in the diet has been linked with various conditions, the most common being overweight and dental decay. Currently it is estimated that we consume approximately 36 kilograms (79 pounds) per person per year which equates with l00g (almost 4 ounces) per person per day. This figure relates to estimated total sucrose consumption (table sugar and that present in prepared food and drink (2001-2004)). It is believed that we should certainly not increase our intake and many nutritional bodies and organizations feel that it should be reduced. The COMA (Committee on Medical Aspects of Food Policy) report advises that we do not increase our current intake of simple sugars, e.g. sucrose, glucose and fructose and the NACNE (National Advisory Committee on Nutrition Education) recommends that we reduce our intake of sucrose by half over the next 15 years. The main emphasis lies in cutting down on the consumption of sugar-rich "between meal" snacks and soft drinks It is the frequency with which "sugar-rich" foods are taken into the mouth, and their physical form, rather than the amount of sugar which is believed to play the greater role in dental decay. Therefore, it is better to eat sweet items with a meal rather than between meals at frequent intervals and when eating a packet of sweets, less damage may be done by eating the contents over a short time, rather than making them last all afternoon. Those items which are chewy and stick to the teeth are likely to be more harmful to teeth than liquids. However, it is the total sugar intake which will increase the likelihood of becoming and remaining overweight. It both instances, benefit may be derived by consuming products without added sugar, e.g. unsweetened tea, coffee, fruit juice, yogurt and tinned fruit or by changing to products which are artificially sweetened (and low in kilocalories), e.g. diet lemonade and low Calorie soft drinks. This is especially important for those individuals who are aiming to lose weight or control their energy (Calorific) intake. FOOD TYPICALLY HIGH IN "ADDED SUGARS" ALTERNATIVES FOR A DIET WITH LESS "ADDED SUGAR"
Honey, dried fruit, e. g. apricots, currants, dates, figs, prunes, raisins, sultanas. Should you wish to reduce your "sugar" intake try to substitute some of high sugar foods with unsweetened, "no added sugar" or reduced sugar items, some of which are often labeled as low Calorie and avoid adding sugar to drinks or food at the table, e.g. cups of tea and coffee, breakfast cereals and milk puddings. Initially you could perhaps use three-quarters of the sugar you would normally add to drinks or recipes, e.g. certain cakes, biscuits, puddings and reduce further when this established new level has become accepted as normal and enjoyable. To overcome the lack of sweetness it may be found beneficial to add extra flavour in the form of essences, lemon juice, peel, coconut, nuts or cocoa. Moderation is a word we frequently hear in relation to our diet. This also applies to sugars. A little generally does no long term harm and cutting back on sugars and fat too much may mean that insufficient kilocalories (i.e. Calories) will be available from the diet. This is especially important for active children because lack of kilocalories from any source will restrict growth and normal development and although energy (kilocalories) expenditure may be large, appetites may not be adequate to cope with this. Carbohydrate consumption produces insulin, the hormone responsible for storing fat (or producing energy). High insulin is associated with virtually every disease known to mankind, including cancer.